Facebook has a bizarre new option available for your business fan pages. 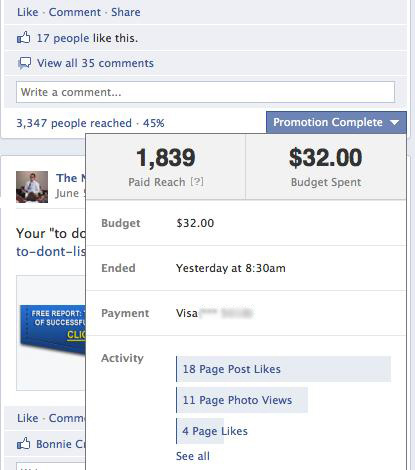 It allows you to PAY for people who “Like” your pages to see your post. That’s right, if someone already “Likes” your page, you can now PAY for them to see your page updates. Aren’t they supposed to be able to see your updates as a fan? That would make sense to me…but not to FB, for some reason. While this seems like a joke, it’s not. But I fell for it last week. Let’s look at my results when I PAID Facebook to “allow me” to communicate with my own fans. I promoted a QnA post to my own fans. It cost me $32 to get it in front of an extra 1,839 fans who ALREADY liked my page. I asked Facebook marketing expert, Brian Moran, for his advice on how to use promoted posts. Do we, *gasp*, use them for commercial intent? Do we only promote posts that promote a product, sale, or opt-in? This might sound hard to believe, but Brian, a 25-year old ‘kid’ from Maryland is actually one of the world’s top experts on underground (real results) Facebook marketing. He has over 225,000 Likes on his page, and he actually knows how to use Facebook fan pages to make money. I’ve invested over $500 in Brian’s products, and they’ve made my fanpage much better (and we’ve only implemented 10% of Brian’s suggestions). I “Like” Brian Moran more than Zuck (and you will too).